Viña Rock is the biggest multi genre festival held in Spain, with an average attendance of 60,000. This year it was already the 9th edition, and there was 4 stages, with a huge number of artists playing, but this live report will focus in La Oreja Metalika Stage, which held the majority of the hard rock/metal acts. Although traditionally this festival is mainly focused on domestic acts, this year the line up for both days looked interesting, and thus, I decided to go for the first time to this huge event. First of all I have to say the weather did not help at all, being both cold and rainny, which at the end, payed its toll on all the attendants., namely almost everybody returned home with a cold. The first two bands playing were DREAMAKER and CENTINELA. The former came as a part of last year's DARK MOOR split up, featuring Elisa (former DM's singer) on vocals. I never was a big fan of Dark Moor so, I wasn't eager to see them, plus their early performance didn't help them to get many people to see them. CENTINELA is quite a different story, I missed them in Atarfe (Piorno Rock), so I was looking forward to see them, sadly, since we all had to get our passes, we could only hear them from the distance, maybe next time, and a real pity, since they're a helluva band live and their new album "La Nueva Ira" is one of the best metal albums in Spain this year so far. 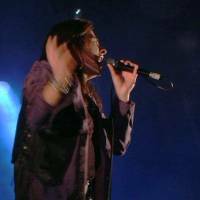 The side project of Saratoga members Leo Jiménez (vocals) and Dani Pérez (drums) is quite different from the melodic power metal of their main band. Stravaganzza sinks its roots into much more extreme elements, Fear Factory, Pantera, Machine Head, slight touches of Gothic Metal, dark lyrics and a big theatrical element in their stage performance looked like an interesting combination prior to the show. Sadly this live presentation of the band (it was indeed their first concert) was not held in the right scenario. Viña Rock is a festival in which 90% of the people go for a good time, lots of alcohol (among other things) and sing along and dancing to easy-to-swallow music, so to say. Plus, in fact two months after Stravaganzza debut "Primer Acto" was released, there was still a huge number of fans thinking they were going to see something like Saratoga. Well, the truth is whilst the band's performance was really good, full of musicianship, passion and theatrical, in other words, they rocked big time, the audience were not prepared for such a show, thus aproximately half of the crowd left during their performance. I guess Stravaganzza are more a band to see at a big venue, or maybe at another kind of festival. Simply, this was not their crowd. If only they'd sing in English I'm pretty sure it would be a band many of you would watch out for. They got all the ingredients needed to make the salad, it's only a question of cooking them well enough. Leo is the number one metal vocalist in Spain (I'm not sure he's the best, but undoubtely he's at the top due to his amazing voice and good technique), Dani is a drummer of top level (no one comes closer in Spain, and he's got nothing to envy to international top drummers), and Edu (bass) and Pepe (guitars/keyboards and main songwriter) provide the ideal complement for the band. One of the few foreign bands on this year's Viña Rock were Brazilians Shaman. 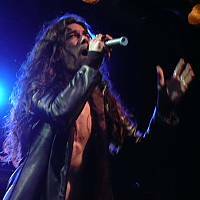 Former after the seccesion of Angra, Shaman features vocal talent of Andre Matos. This metal band is a really talented one. Smart songwriting, which sound fresh and modern (in the good sense), but somehow, I feel that Matos voice is not the right one for the music they play. Don't take me wrong, he's a really brilliant singer, but I think the musical direction of the band needs another kind of vocalist. Good frontman he is, for sure. And really good musicians, specially guitarist Hugo who amazed us all with the storming cover of Ozzy Osbourne's "Mr Crowley". And that's another point for the band, the covers they did (Mr Crowley and No More Tears) and the moment they chose to play them, just when they felt they were losing a bit the audience's interest. That proves this is an experimented band (despite being relatively new to the business). They gathered the biggest audience on friday night and also had the best sound of the evening. Fair enough since they were the most technical band of the day. 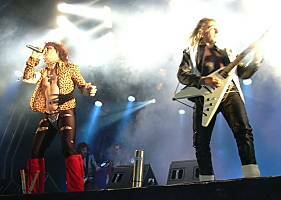 The main attraction on Friday was BELLA BESTIA, a legendary 80's glam rock band who reformed 20 years later for this show. BB were really bad, even awful musically speaking, but had that rockstar attitude that made them much loved among the fans back then, thus this was a very looked forward reunion. It was announced that they would have all the stage show they used back then and in fact they spent all the money they got from this show in that issue. They were given the headline spot for friday night at LOM stage, so that should be true, but the results were a bit disappointing, in some aspects. Let's put it straight, first of all I enjoyed a lot their set, I sang along much loved classics and so did the rest of the audience. But it was clearly a nostalgic show. Bella Bestia never was a good band technically speaking, so no place to expect they would have become Dream Theater 20 years later, more so since some of the classic members (namely singer Pancho) have been out of the music business since back on the days. Pancho simply didn't have his better day at Viña Rock. But bass player Pepe Mari Sansegundo and newly added members Jose and Javi on guitars solved the job problem free. They're still in business, Pepe Mari and Jose in Beethoven R and Javi formerly also in Beethoven R and now with his own band Wayland (signed to AFM). Drummer Lamberto is allegedly a session musician, but according to what I saw (and listen to) the other day, I would never hire them for a gig or a record. But what was missing musically, was overcomed by lots of illusion and guts, so the final result of the test would be something like a C+. There were even some fans who wore make up and outfits like the band used to on their classic album Lista Para Matar. A particularly emotional moment of the set was when Pepe Mari's son, Ruben, who has Dawn's Syndrome, joined the band onstage and sang along with Pancho. It was a dream come true for him to see Bella Bestia live since he was too young back on the days. Much criticism has been made on the fact that Pancho is not in such good shape as he used to (read he is quite fat nowadays) but hey time passes for all of us, you know? And if you ask me it adds a point on his favour that he's able to laugh at himself by still wearing the same outfit and such. All in all a quite enjoyable nostalgia show. On Saturday, the weather turned even worst as it rained a lot. I missed the first band, the Argentinian band Logos, who played while it was pouring down before 36 people (a friend of mine was there and counted the attendants). A real pity since this band is a legend in their own country ever since they were called V8. Nonetheless, according to my friend, they gave a great concert, playing like there were 36,000 people out there. Good on them. One cannot help sympathising with a bunch of guys who travel 12,000 km to play 45 minutes before 36 people in the midst of the Biblical Flood. This was one of the main reasons why I travelled to Viña Rock this year. Having seen the band in Madrid some weeks before, I was eager to see them in a larger stage with bigger sound system. And it was really worth. 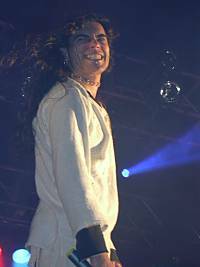 Just one week before the show, lead singer Ivan Urbistondo had surgery on his right knee, and their appearance was questioned till last minute. But they had the guts to play, with Ivan sitting on a chair in the middle of the stage. Ironically he made a remark noticing that this was the first time he was singing with a wireless mic, just the day he couldn't move! Anyway, they proved they are one of the best live bands in the Spanish hard rock scene, with top notch musicians and the best vocalist in the genre in Spain (at least to yours truly). What an awesome performance Ivan did! His soaring vocals, the way he seizes his vocal range, the passion he puts in every note, his sometimes beautiful, sometimes powerful, always thrilling voice... But though being the main attraction in the band, he's not the only one to point, since bassist Javier Canseco's solid performance and awesome stage presence turned him in the temporary frontman of the band. Pedro Vela is always a sure bet on guitars, and keyboardist and main man of the band Juanmi Rodriguez provides the backing and lead playing to counterpoint both Ivan vocals and Pedro guitars. One of the best shows I could see on the whole festival. Well done guys! After last year's departure of half of the band including vocalist Elisa C. Martín to form Dreamaker, guitarist and main man Enrik García was left only with original bassits Anan Kadouri and started to look for new members to complete their line up. They found the right musicians and recorded the fourth album on their career, Dark Moor, which got a fair share of good reviews both among fans and media. Sadly, the line up changes have continued till today, being the saddest moment when Anan had to leave not only the band, but the music at all, due to family problems. Anyway, this was my first Dark Moor show, and I was curious, since their last album, even far from being so great as some claimed, has its moments. Also it was new vocalist Alfred Romero live presentation after their early European tour supporting After Forever. Well, the band lived up to the expectations put on them. Good show, good performances and a really good singer, still a bit fresh but really promising. They played a lot of songs from their lattest album, along with some older stuff and also an Iron Maiden cover "2 Minutes To Midnight", which sounded a bit poor because there's only one guitar in the band as opposed to Maiden's own version of G3 [wicked remark of the day, he he]. They ended up the show with the single out of their last album, "From Hell" which is an instant hit. No question this was the absolute highlight of the festival, as far as LOM stage was concerned. The Argentinian mega stars Rata Blanca is undoubtely the most succesful hard rock band singing in Spanish since Baron Rojo. They are well known in Spain and absolute stars in Latin America, where they sell out big stadiums to the fans delirium. 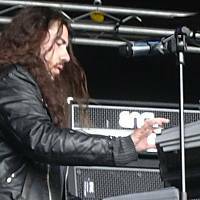 You may have not heard of them, but singer Adrian Barilari has recorded a solo album lately with the help of Nightwish's Emppu Vuorinen and Stratovarius Jens Johansson among others, both in English and Spanish. Anyway, back to Rata Blanca, they've done a few shows in Argentina with special guest Glenn Hughes. That may sound strange to you foreigners reading, but if you take into account Rata Blanca, and specially guitarist Walter Giardino, are big fans of the whole Purple/Rainbow/Whitesnake saga, which you can clearly see in their music, then it's not so strange. Those shows turned out so well that Viña Rock promoters decided to take them to Spain for a one off appearance. The first part of the set was held under heavy rain which didn't scared the thousands of fans who gathered to see them. It was strictly a Rata Blanca set with much loved classics as "Solo Para Amarte", "Volviendo A Casa" or "La Leyenda del Hada y el Mago", which Richie Blackmore would have wished for himself. 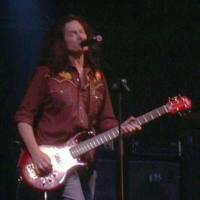 After that one, Glenn Hughes joined the band onstage, to the fans rejoice, and they started out the second half of the show, with a very suitable "Stormbringer" (indeed it was pouring like hell). If you just close your eyes you couldn't tell if it was Rata Blanca with Glenn Hughes or Deep Purple with Walter Giardino, who is also known as the Argentinian Blackmore. No place for doubts or anything against them, Rata Blanca is a hell of a band, all top notch musicians, Fernando Scarcella (drums), Guillermo Sánchez (bass), Hugo Bistolfi (keyboards), Adrian Barilari (vocals) and Walter Giardino (guitars) make the perfect combination when it comes to classic 70's hard rock, and if you add self proclaimed (but fairly enough) The Voice Of Rock to the mix, then you got nothing else that a slice of rock heaven. So impressive the show was that the sun itself showed up to witness it. Other classics they played were "You Keep On Moving", an amazing rendition of "Mistreated" (a personal fave of mine) or the final "Burn", when Barilari joined the fun. By far the best show in Viña Rock and probably the best live set I've seen this year so far. Words cannot explain what we lived there, really. These Basque metallers where childhoood heroes to me. 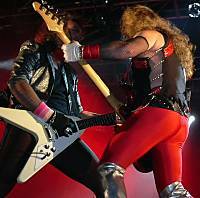 The so called Basque Judas Priest were really big back on the 80's in Spain, and they still are in Latin America, where they've lived for the last 10 years. Specially in Mexico they are almost gods. Well, this show was a much expected one, even after their disappointing last album "Nunca fuimos Angeles", their first studio album in 10 years, which simply doesn't stand any kind of comparison to their early albums, specially the first two. However the band managed to put up a very decent show, with a setlist full of classic material, which the crowd could sing along, and though time has taken a toll on Juan Gallardo's voice, he managed to solve the show without major faults, B- would be the mark for the (once) Basque metal heroes. 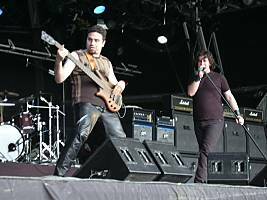 The main band on saturday night were Spanish metal idols Saratoga. The present day number one band in Spain offer the best live show you can see nowadays in any national act. The secret of the formula lies on Leo Jiménez powerful and high pitched vocals, charisma and, why not? good looks. Girls absolutely die for him. Also the amazing drums provided by Dani Pérez (one of the best drummers out there, and I mean not only in Spain, but worldwide) and the brilliant guitar work of Jero Ramirez, who is the main songwriter along with bassist Nico del Hierro, have their role on this success. Nonetheless, they gathered the biggest crowd of the festival (as far as LOM stage was concerned). However what leaves me a bit puzzled about this band is, that being this the second time I saw them, it was pretty much like I'd seen them a hundred times, it was all very predictable. And that's not a good sign in my book. Anyway, I have to say their show was of high level and they know for sure what the fans want and that's exactly what they give them, nothing less, but, (sadly) nothing more.